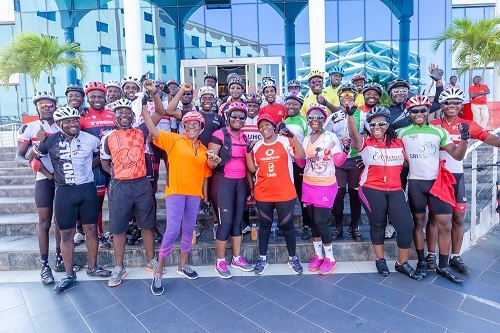 Vodafone Chief Executive Yolanda Cuba has led a team of employees and cycling professionals in Accra on a ride through some key streets of the capital city. The initiative, cultivated some three years ago by Yolanda, also forms part of a Vodafone group-wide campaign dubbed ‘Global Wellbeing Month’, The Wellbeing campaign normally sets aside the month of October to emphasize the importance of sports and physical exercise to the overall well-being of employees within the Vodafone family worldwide. 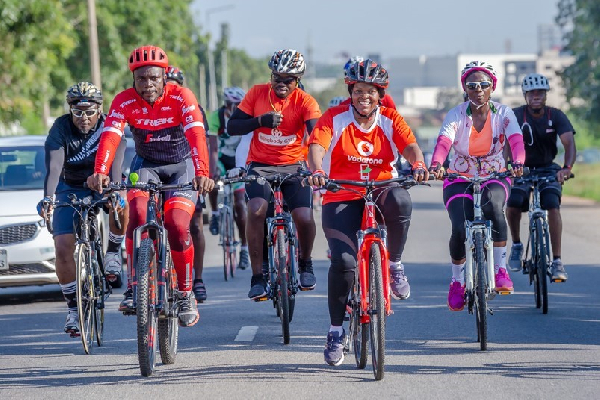 Unlike previous years where Yolanda is accompanied by employee cyclists, the format changed this year when she threw an open invitation to include professional cyclists on her Twitter handle. 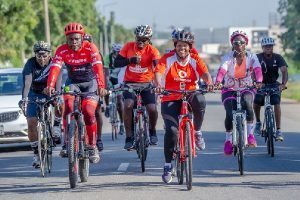 The CEO led the team from the Palace roundabout on the Spintex Road through Action Chapel to the company’s headquarters in Airport City, Accra. The climax of the month will be a Business Fusion session (a day of games and team bonding) to entrench the spirit of good health and exercises amongst employees later this month.